City University London’s annual George Daniels Lecture on 2nd December will feature the screening of the documentary film, “Roger W Smith: The Watchmaker’s Apprentice”. City’s annual George Daniels Lecture on 2nd December will feature the screening of the documentary film, “Roger W Smith: The Watchmaker’s Apprentice”. The event will take place in the Oliver Thompson Lecture Theatre (OTLT) at 6:30pm. In a legendary career spanning six decades, George Daniels CBE, DSc, FBHI, FSA (19th August 1926-21st October 2011) created the co-axial escapement, one of the most significant developments in horology for the last 250 years. Daniels studied horology at City’s predecessor, the Northampton Institute. After his death, the George Daniels Educational Trust administered the substantial funds he bequeathed to provide scholarships for City’s students and to benefit research in measurement and instrumentation at the University. For Roger W Smith, Daniels was an inspiration and a mentor. Their unique collaboration further developed the art of British watchmaking. 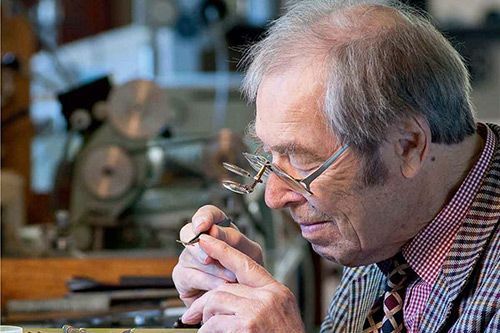 From George Daniels, Roger learnt all of the thirty-two skills required to design and make a watch entirely by hand. He has continued to honour his mentor by incorporating the Daniels Workshop into the Roger W Smith Studio. Roger, now resident in the Isle of Man, is also a Liveryman of the Worshipful Company of Clockmakers. He is eagerly looking forward to being part of next month’s annual event: “I am delighted to be participating in the annual George Daniels Lecture. City was of tremendous importance to George, especially given his beginnings at its previous incarnation, the Northampton Institute, where he studied horology and has left a substantial legacy for the provision of education in scientific instrumentation.” After the screening of the film, Roger and Chairman of the George Daniels Educational Trust, David Newman, will take questions from the audience. David is also a Freeman of the City of London and a Liveryman of the Worshipful Company of Clockmakers. 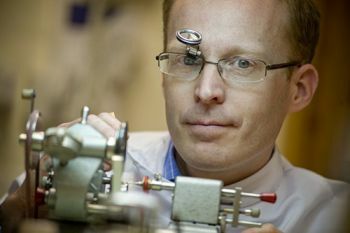 Under his stewardship, the Educational Trust encourages excellence in clock and watchmaking through education and apprenticeships, providing grants and bursaries to those who wish to pursue a career in horology in the UK. The Trust also provides grants and bursaries for postgraduate students in the School of Mathematics, Computer Science and Engineering. For more information on Roger W Smith please visit this weblink. Please register here to attend this free event. Invented in 1974 and patented in 1980 by George Daniels, the Co-axial escapement is a modification of the lever escapement with some features of the detent escapement. Considered by some to be one of the most significant horological advancements since the invention of the lever escapement, the Co-axial escapement functions with a system of three pallets that separates the locking function from the impulse, avoiding the sliding friction of the lever escapement. This eliminates the requirement for the lubrication of the pallets and removes one of the shortcomings of the traditional lever escapement.